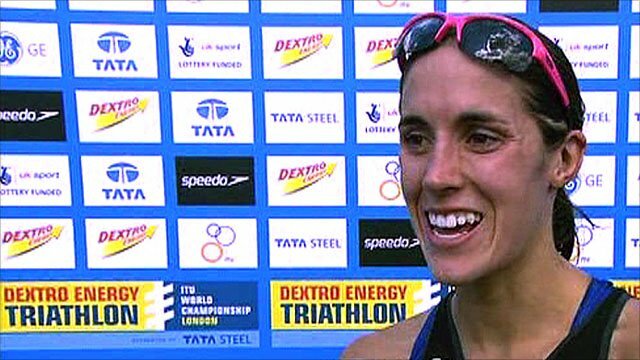 Britain's Helen Jenkins finished third in the Hyde Park Triathlon, round five of the World Championships Series. Unheralded Canadian Paula Findlay broke away from the leading pack of four on the final mile of the run to win in 1 hour 51 minutes and 48 seconds. Switzerland's Nicola Spirig was three seconds slower, pipping Jenkins to second place by just two seconds. "I'm really happy with my race," said 2008 world champion Jenkins, who was also third in the 2009 Hyde Park race. "I didn't have a great swim, and I tried to work hard on the bike. My plan was to work hard for the whole race and not just the run." Jenkins, from Bridgend in South Wales, is fifth in the World Championships series, with Australian Emma Moffatt - who finished ninth - still leading the standings. 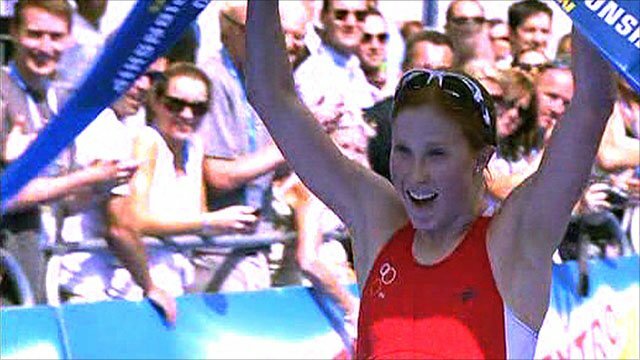 Fellow Britons Vicky Holland and Jodie Swallow came home sixth and seventh, 51 and 59 seconds back respectively. The series next visits Kitzbuehel in Austria on 14 August, before ending in Budapest, Hungary on 8 September. Meanwhile, it has been announced that two British Olympic medal winners will form part of a team to compete in the relay discipline at next month's London Triathlon. Cyclist Rebecca Romero, a gold medal winner in the individual pursuit at the Beijing Games, and Cassie Patten, who won bronze in the 10km swim in 2008, will attempt to break the course record of 1:05:27secs. Former 5,000m European junior champion Emily Pidgeon completes the team line-up and will run the final leg of the race, which starts and finishes at the ExCel Centre on 7 August.